I have a few disclosures before I share my first recipe. 1. I don’t like to measure stuff. I eyeball. I appreciate that not everyone cooks like that so I am going to do my best to give measurements. Luckily there is only one actual measurement in this recipe. If it feels like too much or too little, feel free to adjust as needed. I promise my feelings won’t get hurt. 2. I don’t claim to have invented anything that I cook. I usually see something that sounds good and then pick and choose what I want to add. I love to substitute stuff. The recipes I share are just tried and true basic blueprints that you can dress up or down. 3. This last disclosure has nothing to do with the recipe it is just a plea to forgive the bad flash photos. I am hoping that a bad photo is better than no photo. I promise the pics will get better. Just stick with me. And now that I have put that all out there let’s cook. 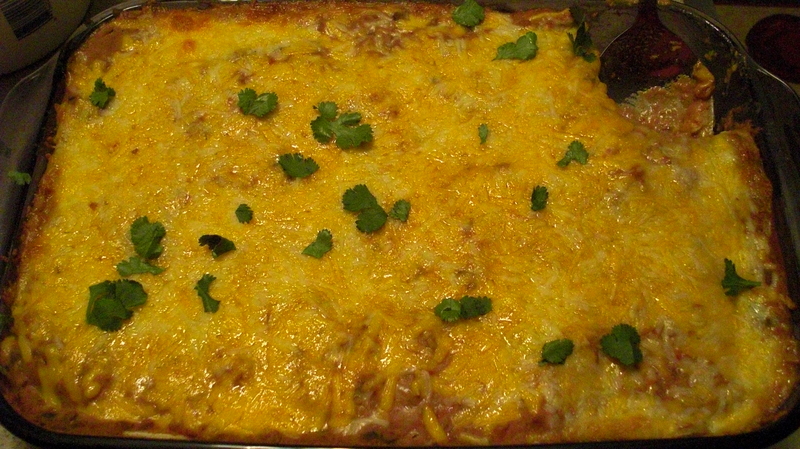 Burrito Pie is super YUM! It can be made ahead and so is perfect for potlucks or for when you know tomorrow is going to be a long day. *We really like olives in this house and we like a bargain so we buy the whole olives and then slice them because you get more for your money that way. To make slicing them a snap we use an egg slicer. ***Sans sour cream and cheese and you’ve got vegan heaven. I use a potato masher to make the job go faster. 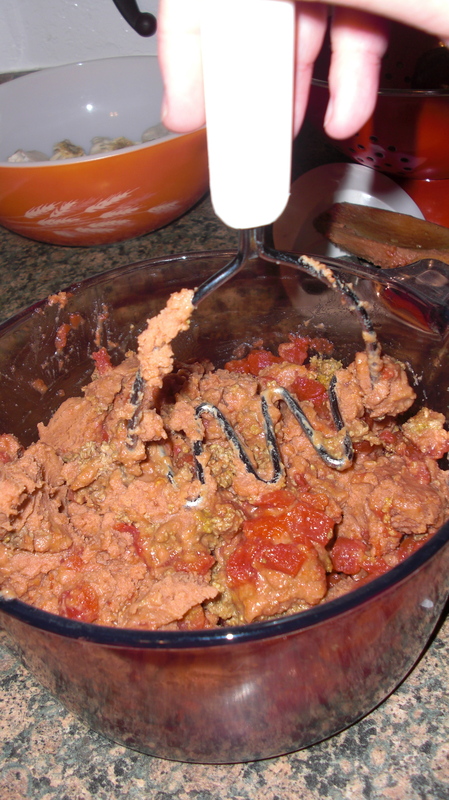 Once everything is nicely mixed, begin layering like a lasagna, in a rectangular baking dish. 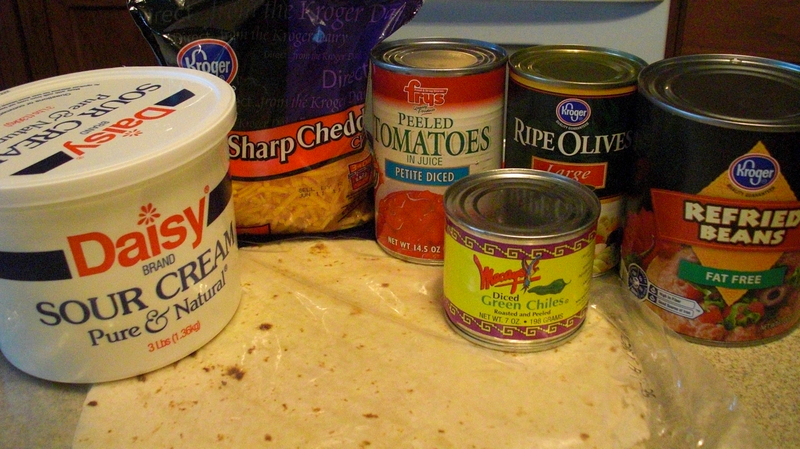 First the bean mixture followed by cheese then a layer of tortillas and repeat until it almost reaches the top. I usually get 3 layers in. Then bake at 400 until cheese is melted usually about 12 minutes. I serve this with chips, salsa and sour cream. Bonus: It’s even better the next day. Looks delish…. Actually nothing sounds good these days 😉 but on a normal day that looks right up our alley! Thanks! I hate days like that. I hope that passes soon!